Make notes of what needs working on for the next rehearsal - before you go down the pub and forget it all. Fly solo and book a rehearsal room on your own. You will find that rehearsal spots sometimes do special deals for drummers, take advantage of them. Take along your bass player and try out all those smart grooves the songwriters will never let you play! Get some groove ideas for songs together and take them along to the next rehearsal with the 'proper' musicians. If you're bored or lacking in inspiration, try playing familiar tunes much slower or much faster. Try playing familiar songs in different styles - if you're a metal band try playing funk, pop or folk versions of your songs... it worked for Led Zeppelin. Try improvising. 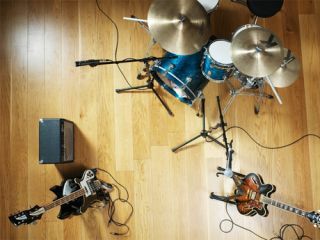 Jamming can be a waste of time, but equally it can be the way you develop a band identity and gel as a unit. Jamming can also lead to new material. And you the drummer can then claim a co-writing credit.